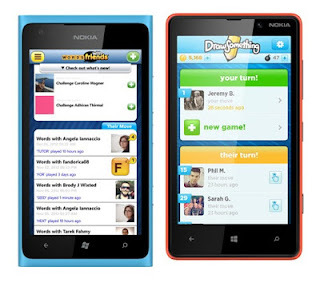 Last month Nokia announced Free version of Draw Something exclusively for their Nokia Lumia Windows Phone devices. Now Zynga announced Paid version of Draw Something and Words With Friends for Windows Phone devices. Both games cost $2.99 and run on Windows Phone 7.5 or higher. Draw Something is a two-person game where players take turns drawing and guessing randomly-provided words (there are 2500 to choose from.). Words With Friends is a social word game challenging players to use their allotted tiles to build words and score points. You can chat and play with Facebook friends or random opponents and juggle up to 20 games simultaneously.